Interior designers, manufactures and suppliers across the globe showcased their products at Index Qatar exhibition that took place from 13 to 15 November 2017 at the Doha Exhibition & Convention Centre. Companies across the world from furniture, interior design and lighting sector is participating in Qatar’s fast growing fit-out and contractor market for interior designers that is likely to reach $1.5bn next year. Sheikh Khalifa bin Jassim bin Mohammed Al Thani, Chairman, Qatar Chamber and Hassan Al Ibrahim, Chief Tourism Development Officer of Qatar Tourism Authority, opened the three-day exhibition. Index Qatar Event Director Jaafar Shubber said the exhibition will witness daily seminars that will see the participation of renowned designers from the region and the world, as well as a series of interactive events and activities. 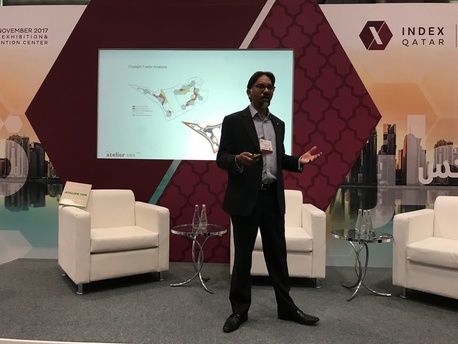 Anuran, Atelier Ten Doha’s director, presented one of the seminars titled “Invisible Architecture” explaining how they succeed in integrating the environmental services so that they are invisible and unremarked, while doing it in a sustainable manner. Topics such as healthy buildings, the importance of benchmarking and future design trends in environmental design were presented using examples of projects they have done.